After a year away, engaged in such activities as cycling the Camino de Santiago, biking the Trans Pennine Trail, and being held hostage during an armed siege in provincial Argentina, I'm back and now based in York. A cycling city. A kind of budget-price Cambridge. Which is why I'm here, not there. 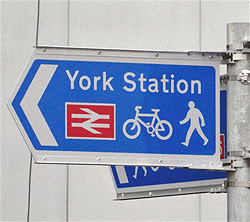 York station - in the ice-cream-vernacular of press releases - has just scooped the title of Best Cycle Station of the Year at the ATOC awards, held at the House of Commons a few days ago. It's easy to mock these contrived and meaningless awards as just an excuse for back-slapping, so let's do so. 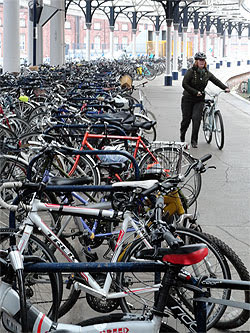 But York station is pretty good for cyclists, with 400 hundred cycling parking spaces on a disused platform (right). Or, if you're going to be all technical and restrict yourself to unoccupied ones, four spaces. I met one bloke who'd had to walk so far to find a rack he'd raised two hundred quid for charity. However, long-disused bikes apparently get hoovered up, reconditioned and sold by the excellent and friendly Bike Hub project a few hundred metres away under Lendal Bridge. Access to York station from the north has been greatly improved by the opening of a new access ramp from the riverside (right, and bottom right). In our minds, this is one of the most genuinely useful cycle facilities we've seen in the last few years. The ramp cuts out a five-minute detour on busy roads, or a push up one-way streets, and takes you straight on to the main platforms. It's spacious enough to do with a bike trailer full of enough stuff to run a small refugee camp, as I know from experience, and much liked by the Brompton-toting commuters I talked to this morning. East Coast, I'm told, stepped in with extra cash and commitment when problems arose during the building, so many thanks to them for helping ensure completion of such a good facility. 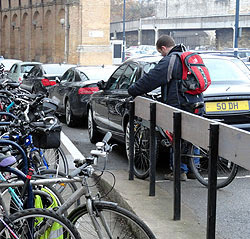 At the end of the cycle parking, though, there's something odd. 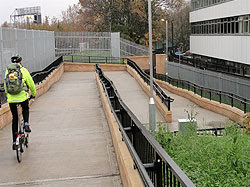 The near end of the racks has a recent smooth access ramp for those pedalling out south into the car park and onto the main road. 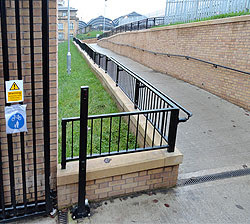 The far end also has a ramp right up to platform level - but it's fenced off and often almost impossible to get a bike past thanks to its status as 'executive parking'. This puzzled bloke (right) did his best to squeeze through past the big posh car. We'll chase it up. With the recently opened branch of the exuberant, real-cycling shop Cycle Heaven in the station too, and a new real ale pub opening up, the York Tap, things are looking good. Not quite as much happens in York as in London, so I'll be updating this blog weekly rather than daily, but I look forward to being back in circulation. Like, er, a bad penny. Whoo! Thanks everyone at SMB! Last time I was in Brize Norton, I was staying with an RAF mate of mine. Can't remember who we were at war with or which recession it was though. But I seem to remember a lot of Duran Duran. 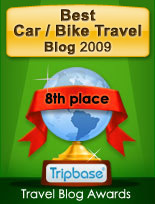 Welcome back, I missed your rye comments on UK cycling, but was happy to read that you survived your Agentinia "ordeal". 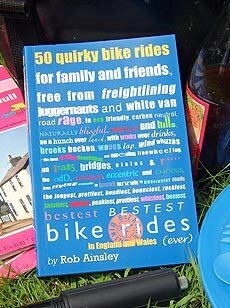 I am slowing working my way through your 50 UK quirky bike rides book, very enjoyable. Thanks for the plug Rob - we also stock your book. There is also an new access ramp to the car park at the southern end of the station into Lowther Terrace, which means you can avoid using the inner ring road to get to the station. We have photos of the northern access on CycleStreets (including Rob at www.cyclestreets.net/location/32697/) but none of the new Lowther Terrace access - could someone do the necessary?? Ta. Welcome back! Off to read about your adventures abroad now..